Campbell, A.b.. "Wheat". The Canadian Encyclopedia, 04 March 2015, Historica Canada. https://www.thecanadianencyclopedia.ca/en/article/wheat. Accessed 26 April 2019. Wheat is the common name for members of genus Triticum of the grass family (Gramineae) and for the cereal grains produced by these grasses. Because of its early maturing quality, Saunders's Marquis Wheat greatly extended the area where wheat may be safely grown (photo courtesy Grace Taylor). Wheat is the common name for members of genus Triticum of the grass family (Gramineae) and for the cereal grains produced by these grasses. Wheat figures among the three most produced cereals in the world, along with corn and rice. Canada is the world's sixth-largest producer and one of the largest exporters of wheat, annually producing an average of over 25 million tonnes and exporting around 15 million tonnes. Within Canada, wheat is the most important cultivated crop (grown on an average of over 10 million hectares), though canola is increasing in significance. Only one class of durum is grown, amber durum; however, there are several classes of common wheat, based on factors including seed hardness and colour, sowing time (autumn or spring) and the region where the varieties are grown. Wheat has several uses, including flour for baked goods and pasta, and feed for livestock. In addition, it is used to make beer, vodka and biofuel. Wheat contains gluten protein, which forms minute gas cells that hold carbon dioxide during fermentation, allowing dough to rise and resulting in light bread. 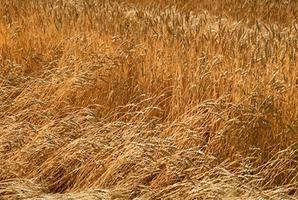 Importers of Canadian wheat often blend it with weaker wheats before using it for bread. For this reason, much effort goes into maintaining the strength and mixing qualities of Canadian wheat. Maintenance involves controlling cultivars (i.e., cultivated species) grown and applying a comprehensive grading system. 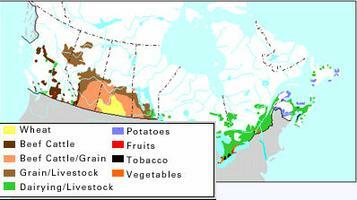 Close to half of all Canadian wheat is grown in Saskatchewan, followed by Alberta and Manitoba. Cultivated forms of wheat evolved from natural crossings of wild species, followed by domestication and selection by humans. Wheat was domesticated in Southwest Asia over thousands of years and spread across Asia, Africa and Europe. Introduction to North America took place in the late 15th century and the 16th century. The most important modern cultivars are common and durum wheats, which are usually given the binomial designations T. aestivum and T. turgidum var. durum respectively. In Canada, wheat was probably first grown at Port-Royal in about 1605; the first exports were made in 1654. Although personnel at some Hudson’s Bay Company posts experimented with wheat, and the settlers at the Red River Colony had some success in 1815, the early years in Western Canada were precarious ones for wheat farmers. Many cultivars from Europe were tried: some were winter wheats that could not survive Canada's severe winters; others were spring wheats that matured too late for the short growing season. The cultivar Red Fife, developed in Ontario, became very popular because of its good yield and excellent milling and baking qualities. By about 1870, Red Fife was popular on the Prairies, but it, too, froze in the fields in years with early frosts. Later investigations have revealed that Red Fife is actually the central European cultivar Galician. 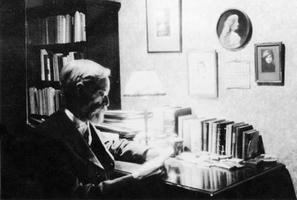 William Saunders, the first director of the Dominion Experimental Farms, was interested in plant breeding. His son, Sir Charles Saunders, took over the wheat-breeding work in 1903 and developed the cultivar Marquis from a cross, made some years earlier, between Hard Red Calcutta and Red Fife. He had a small increase plot (12 plants) of Marquis in 1904, but it took several years to verify that it matured earlier than Red Fife and had excellent yield and superior milling and baking qualities. It was distributed in the spring of 1909 and quickly became popular throughout Canada. Western wheat production was increasing rapidly at this time, from 2 million tonnes in 1904 to 3.7 million in 1906 and 7.7 million in 1913. Red Fife and Marquis made Canada famous for its high-quality hard red spring wheat. Marquis was later adopted as the statutory standard of quality for this class of wheat, a position it held until 1987. Stem rust (Puccinia graminis tritici) is a fungus disease disseminated by spores, which can be carried by wind for thousands of kilometres. In Canada, epidemics in 1916, 1927 and 1935 caused losses estimated at about 3.6, 3.3 and 3.2 million tonnes of grain respectively. The Dominion Rust Research Laboratory was set up in Winnipeg in 1925 to investigate stem rust and to develop resistant cultivars. Their first cultivar — called Renown — was distributed in 1936 and has been followed by several other important cultivars (e.g., Selkirk, Manitou and Neepawa); however, the Thatcher cultivar, developed in Minnesota and licensed in Canada in 1935, became the dominant form for many years. A new physiologic race of stem rust became epidemic from 1953 to 1955, causing losses of at least 8 million tonnes of grain. Since that time, stem rust has caused little loss, but leaf rust (P. recondita) has been a problem because of its rapid changes in virulence. Cultivars resistant to both rusts are available. In Alberta and Western Saskatchewan, rust was rarely a problem, but drought and wheat stem sawfly (Cephus cinctus) were. The sawfly, which occurs mainly in the area from Swift Current, Saskatchewan, to Lethbridge, Alberta, cuts stems so that the heads fall on the ground and cannot be harvested. Resistance has been obtained by developing cultivars with solid stems (e.g., Rescue, which was licensed in 1946). Agricultural research stations in the area have since developed a number of resistant cultivars with better yield and quality. They also work on developing drought-resistant cultivars. See also Commodity Inspection and Grading; Agriculture and Food. Marg NewtonA profile of Marg Newton from the Canadian Science and Engineering Hall of Fame.